We previously studied different formulas for Ohm’s law which are used in electronic circuits to calculate different parameters. The Ohm’s triangle is actually a visual representation of Ohm’s law which makes it easy to understand it. Let’s consider a triangle with three labels V, I and R.
A 22 kΩ resistor has 10 mA current flowing through it. 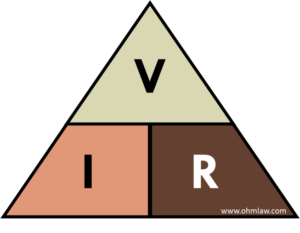 Use the Ohm’s triangle to find the value of connected voltage source. 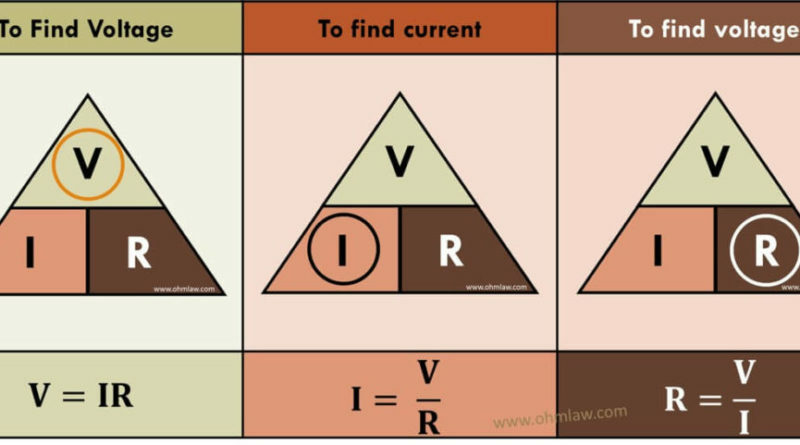 From the left triangle, we obtain V = IR which states that voltage is directly proportional to resistance and current. Here V = 10 mA * 22 kΩ = 220 V. So value of connected source is 220 V.
Let’s use the second Ohm’s law triangle in another example. The protection relay at a power system requires 26 mA current for triggering purposes. Using ohmmeter the resistance of relays is found to be 200 ohms. Find the status of the relay when the source voltage is 5.2 V.
Solution: From the statement, I = V/R = 5.2 V / 200 Ω = 0.026 A or 26 mA which perfectly matches the operating value and hence relay will operate. The fuel meter of a car uses the gauge requires 10 mA for the proper operation. A 12 V battery powers the gauge meter of the car. Recommend an appropriate resistor which should be employed in the meter for proper operations.